Realistic military sim Arma 3 has sold a muscular four million copies since its launch in September 2013. That’s one hell of an achievement since it’s exclusive to PC, and to celebrate, developers Bohemia Interactive have made the game free for the weekend. For more gun thrills, check out the best FPS games on PC. The fun has already started – head to the Steam page to play for free right now – and will last until Monday evening at 18:00 BST (10:00 Pacific). Should you partake, you’ll get full access to the base game, and if you like what you see, the base game and all its DLC is getting massive discounts of up to 66%. Those discounts will end at the same time as the free weekend – best get some playtime in soon so you can decide if you want to take advantage of them. Arma 3 itself usually costs £29.99 ($39.99). Its DLC ranges more widely in its price. If you didn’t know, Arma 3 is a military sim that aims for realism. There’s a short single-player campaign, but the highlight is the multiplayer, in which dozens of players vie to dominate huge sandbox-style maps full of vehicles and weapons to use. There’s also a robust tradition of community creation – previous Arma games were the incubators for the battle royale genre. And it keeps on going. 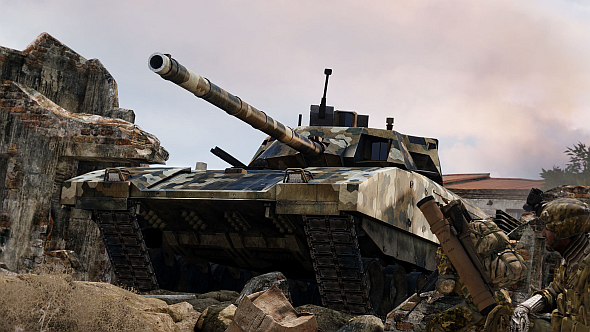 Arma 3’s latest release was the Tanks DLC, which landed earlier this month and added several new armoured vehicles, new weapons, and a new game mode.